The ringman is by far one of the most important additions to any auction. Their expertise can single-handedly raise thousands of extra dollars for your organization’s event. A professional ringman makes the bid happen. A volunteer bid spotter waits for the bid to happen. A professional ringman knows the who, what, where, why and how when it comes to performing at any type of auction. 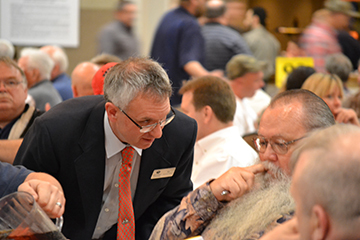 A ringman tactfully “working” with a bidder, encouraging him to bid again. You can see the bidder is in deep thought. Professional ringmen are outgoing and straight forward individuals. Enthusiastic and excitable, they live in the world of action. Professional ringmen have an exceptional ability to read body language. They are experienced to “cue in” on body posture, gestures, facial expressions and eye movements. They “see” what the bidder is or isn’t saying. Professional ringmen know how to effectively communicate with the auctioneer. Who: A professional ringman knows who is bidding at all times and who the last bidder was. The professional ringman is specifically trained and experienced, and is fully prepared for your event prior to the auction. A professional ringman is trained to work the crowd before auction. They quickly assess different personality types and build relationships with prospective bidders by learning their names. They also find out what auction items bidders are interested in so when it comes auction time, they can position themselves by these bidders to help encourage the bidding. What: The professional ringman always knows what the bid is and what price the auctioneer is asking for. Most professional ringmen work primarily with the same auctioneers. They know their chants, their mannerisms and their tendencies. They have also familiarized themselves with every detail of each live auction item. The ringman is an on-the-floor salesman that interjects a dynamic force of electricity, enthusiasm and professionalism to your live auction event. A volunteer bid spotter isn’t trained to know the fundamentals like professional ringmen. This is why they wait for the bid to happen. It’s not reasonable to expect them to be experts. Where: A professional ringman recognizes the difference between a bidder who is no longer interested in bidding versus a bidder who needs gentle prompting to bid again. Because he is specifically trained in the art of reading body language and salesmanship, when successful, this methodology in itself can literally add hundreds if not thousands of extra dollars to the bottom line on each item. A volunteer “bid spotter” just doesn’t know the same important fundamentals of serving at an event as a professional ringman. “Bid spotters” have their own careers, hobbies and interests and normally serve in this capacity once a year. It’s not reasonable to expect them to be experts in the “art” of a professional ringman. “Bid spotters"’ may be used at your event, however, their role should not be confused with that of the professional ringman as it is considerably different and less significant. It’s difficult to place limitations, restrictions or high expectations on volunteers – especially if those volunteers have paid to be at the event itself. The volunteer bid spotters normally have insufficient time or experience to work their section and properly prepare for the live auction. Many necessities and typical distractions contribute to this. For example, conversations at mealtime are not strategic. This is valuable preparation time for necessary prospecting with potential bidders for the live auction and it is almost always wasted. If you are using staff, how many other duties and tasks do they have that evening? Are they the right people to encourage those board members to bid? Can they effectively communicate with your auctioneer? Can they follow his/her chant? Have they had time to adequately meet with him/her to learn their mannerisms and tendencies? If you are using a volunteer auctioneer, a well-meaning newscaster or celebrity, this just adds to the compounding challenge of your event. Why: Because of his training and expertise, a professional ringman knows why that event attendee HAS to have that fishing trip and why the other attendee won’t let them get it! He has spoken to both of these bidders during the time leading up to the auction. He knows the rationale and the desire behind the bidders. He asks questions and gets answers. In the most informal of conversations he can glean from the bidders the information he needs before the auction even begins! Where: A Professional ringman knows where the current bid came from, where the one before that came from and even the one before that. He also knows where the next bid is likely to come from and where to go if those bids dry up to find more. 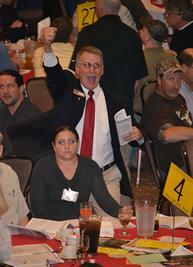 How: A Professional ringman knows how to properly communicate with the auctioneer. The ringmen work independently and as a team to help generate more bidder participation. A professional Ringman adds instant electricity to your event!